The above photo shows one passionfruit that is round and has smooth skin, and one passionfruit that has crinkly skin. 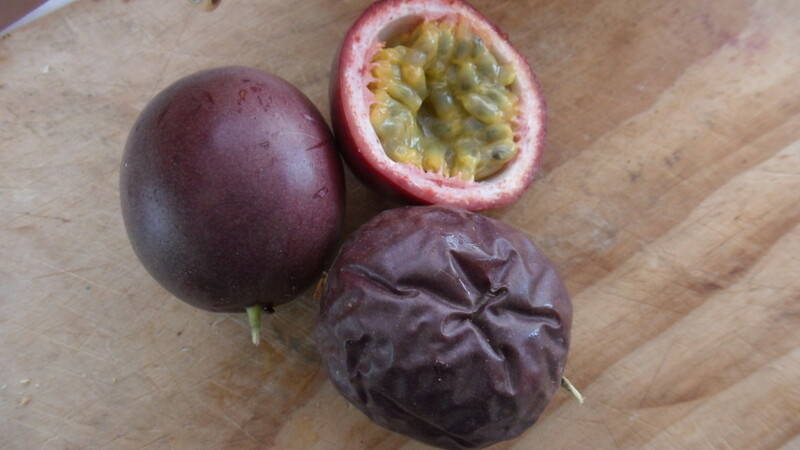 The smooth skinned passionfruit is freshly-fallen from the vine and has a tart flavour. The passionfruit with crinkly skin is older and has been off the vine for about 10 days and has developed a sweeter flavour. We used a mixture of both freshly-fallen and some older passionfruit in this recipe. If you use passionfruit that are all crinkly, i.e., sweeter, then you may need to use less sugar in this recipe. Scoop out the passionfruit pulp. Place the pulp and sugar in a saucepan and bring to the boil on a medium heat. When the mixture is boiling turn the heat low enough so the bubbles keep forming, but the mixture does not stick to the bottom of the saucepan. Stir every now and then to prevent sticking. Boil for 5 minutes. While the pulp is boiling prepare and sterilise the equipment used for bottling the pulp. Pour boiling water over a sieve and over a large heatproof bowl, and dry. Next, sterilize the preserving jars. Wash the jars in soapy water, then pour boiling water over them to rinse thoroughly. Dry jars, and then place in the oven at 150 degrees Celsius. Keep them in the oven until ready to fill with pulp. 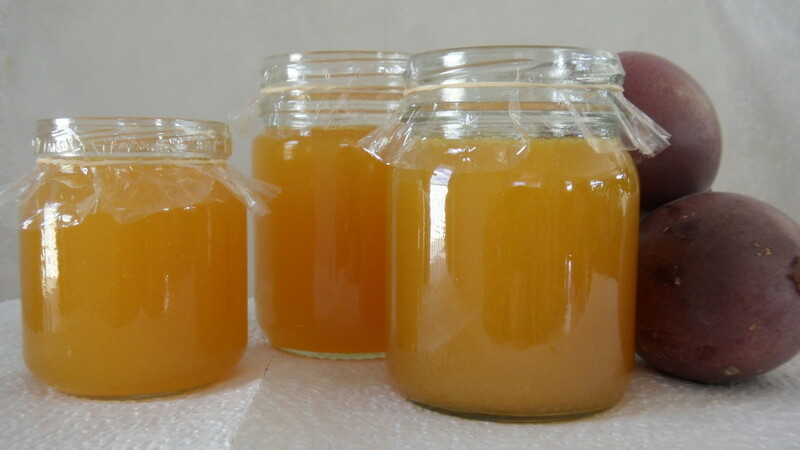 The jars need to be hot as the boiling hot passionfruit pulp may crack the jars if they are filled when cold. After 5 minutes boiling, remove the passionfruit pulp from the heat. Leave to cool for a couple of minutes – this is for safety so the mixture is slightly cooler to work with, so you are not pouring a boiling hot mixture that may splash. Sieve the pulp into a bowl. Unless you have a large sieve, it is best to do this in batches – sieving, then discarding the seeds, and pouring another lot of pulp into the sieve. Wash the saucepan and place it back on the element and return the sieved pulp to the pot. Heat on medium heat until boiling. This is optional, but if you want the pulp to be a drizzling consistency rather than be thick and dollopy, add about 1 ½ tablespoons of boiled water to the pulp until it is the consistency you like. Carefully remove the hot jars from the oven and pour the passionfruit pulp into the jars. Cover jars with cellophane, or metal seals. 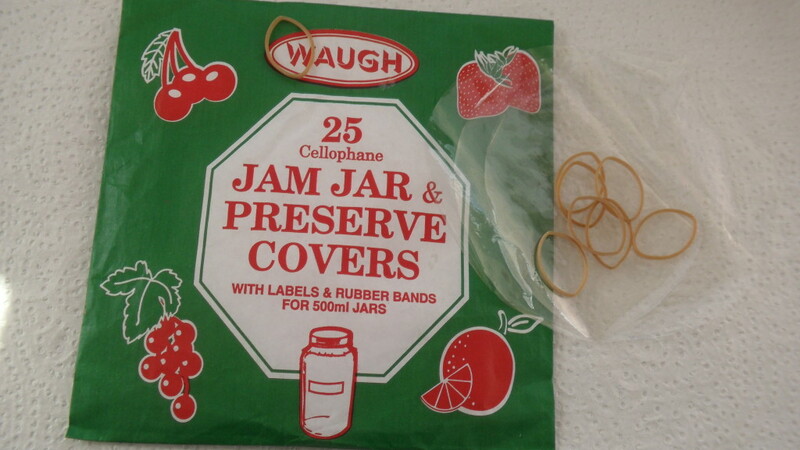 We used cellophane rounds that are wet with cold water and stretched over the hot jam jar, then secured with a rubber band. Keep the sealed pulp in the pantry or refrigerator. Once opened, keep chilled.